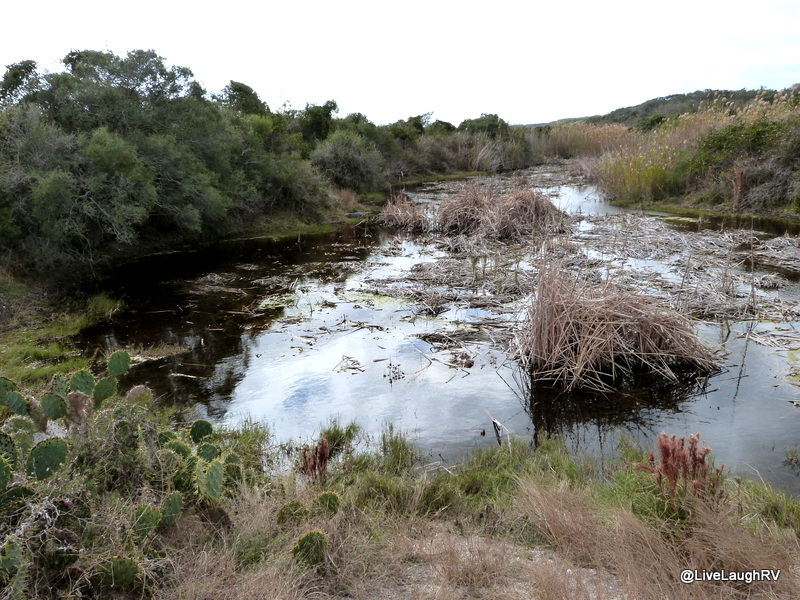 Ingrid, Love your write ups on the Aransas Wildlife Refuge. We haven’t been to that one yet. Still more exploring to do! Great photos of all the wildlife and surroundings. Texas is a big state, isn’t it? 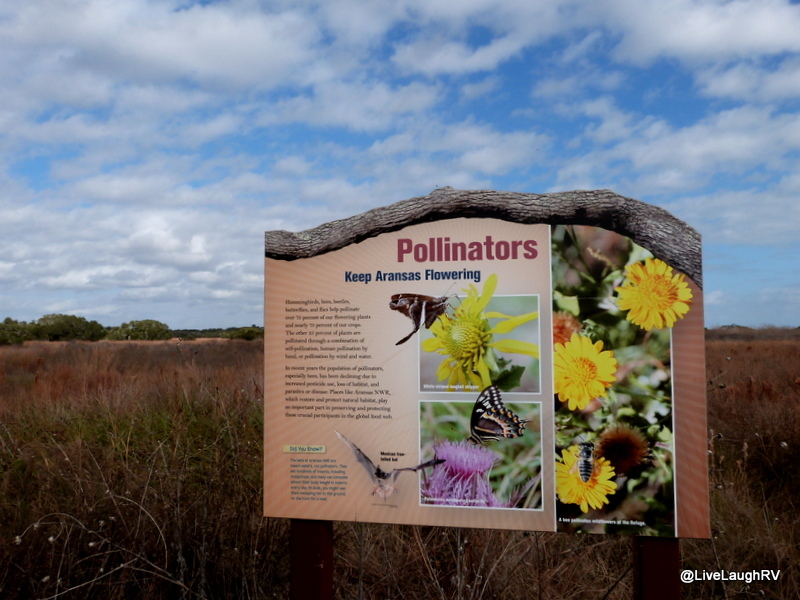 I really enjoyed the Aransas Wildlife Refuge, but talked to other folks who were disappointed. Wonderful! Thanks for taking us there. Beautiful words. Very atmospheric, Ingrid. You’ve captured the birds in flight well to. You don’t need a new camera! But I won’t tell Al. need . . . I understand. Gorgeous capture of the white pelicans in flight! They are among my favorite birds, too. So glad you’re enjoying Rockport! I felt your pain….quietly communing with nature, enjoying the moment then….loud voices! Kids, adults, dogs, bus tours, etc., they all drive me crazy. The folks next to us here at Holiday Cove are soooo loud and they seem to think everyone is awake because they are! Ah well, I have to live in this world, so I better get a thicker skin, eh? Thanks for sharing your day and those fantastic pictures. I agree with Pam, I bet lots of people go home complaining about not seeing a thing. You just need to sit still and look for nature to open itself to you. The beauty of this lifestyle …. ‘all is temporary’. I’m not overly joyed with our current RV Park but I’ve adjusted and realize I can put up with lots of things for 30 days. Aren’t you glad you don’t own the site and they’ll always be your neighbor? 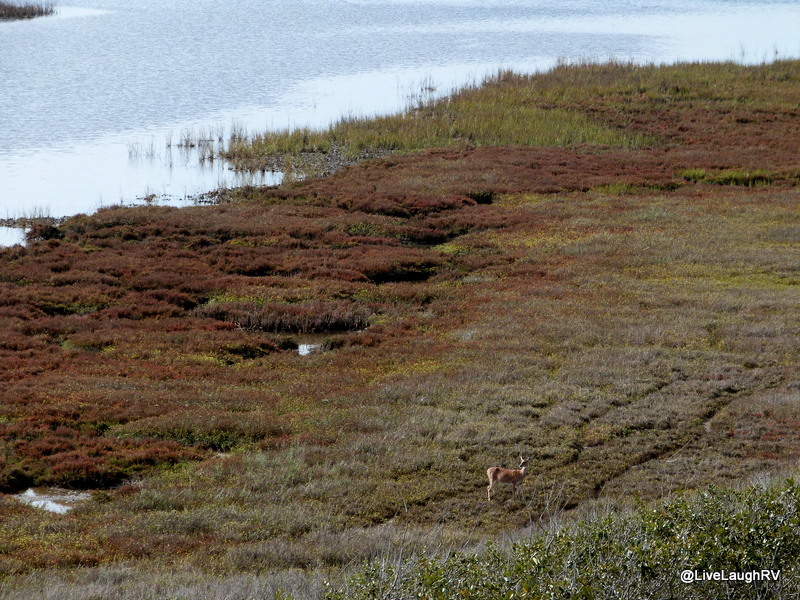 The whole point of the refuge is for the wildlife and we are mere observers-guests and as such we should be quiet and respectful; that’s my two cents anyway LOL. Ingrid, there is nothing more peaceful than standing still, all by yourself, in the wilds of nature and breathing in the beauty! Beautiful captures!!! Thanks Larry. It was a fun morning. The endangered whooping cranes are a real treat to behold. I used to take my kids and expose them to things outside of the amusement realm but always made sure they were well rested and fed. Now that they’re older they appreciate the diversity they were exposed to at a young age. What a wonderful collection you have captured. 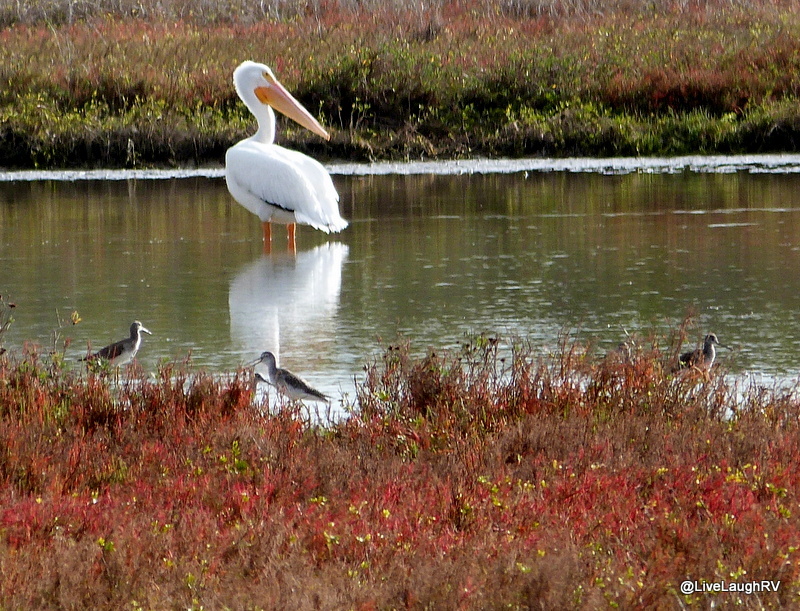 I love the HUGE white pelican with it’s white reflection across the water. 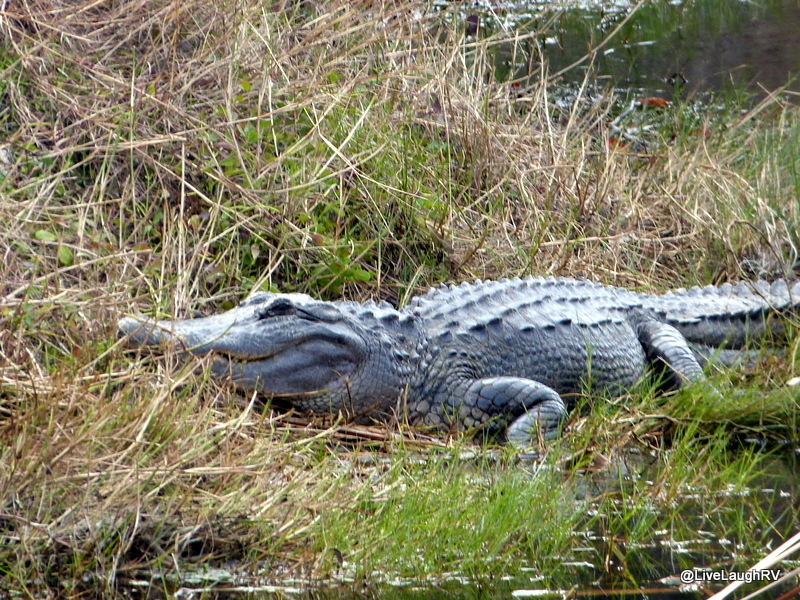 And the alligator….not a baby one there! Loved the show! Nice rest of the day Ingrid….wonderful photos! I totally agree about the area around Lamar…have you been to the little church and old cemetery in Lamar? I believe the old fire station is there too. We love riding our bikes around all those residential roads and out toward the bay…Can’t wait to get there! Yep, ride my bike or walk all around here….love it. Since you’ve been here and road around then you’ll know where to find the whoopers. Best seen before 10:00 a.m. either off 4th Street or Eleventh. Most times they seem to start on 4th then fly off and land on eleventh (in the field with the cows). I’ve been lucky being there to catch them fly off. Oh my gosh…some of these photos blow me away. You are very talented Ingrid. If only I had the time and money to be able to spend a week or two there! They always take flight when I least expect and can’t get my camera set to ‘burst’ soon enough….sigh. That pelicans in flight shot is one of my favorites. It was so cool watching them fly. 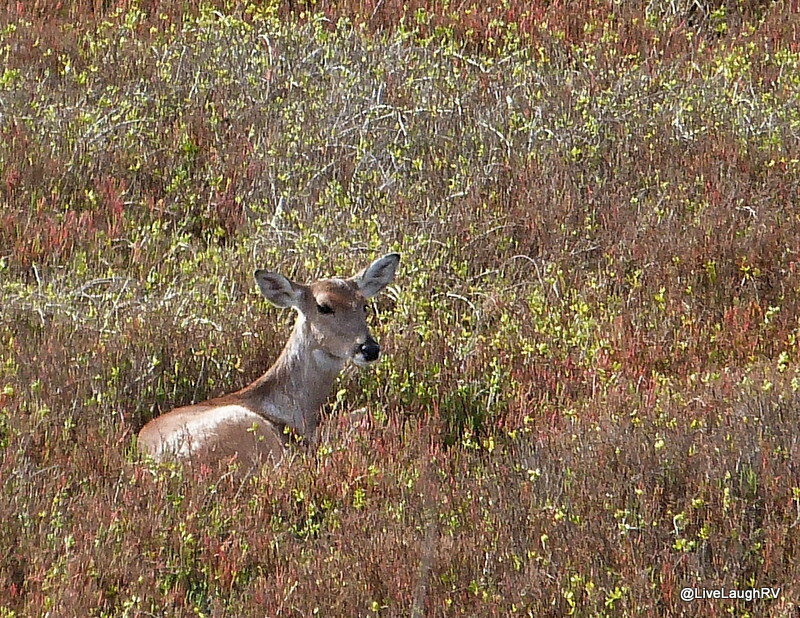 This was captured inland on the auto tour loop. I am assuming that many families return home telling people there was nothing to see. It amazing me how loud people are, both adults and their children! We enjoy the quiet of the area. And you most definitely need the quiet for the wildlife. Your birds in flight shots are wonderful! I love that huge white pelican! What a great way to spend a little time and you got a lot of great shots – I especially like the cranes. 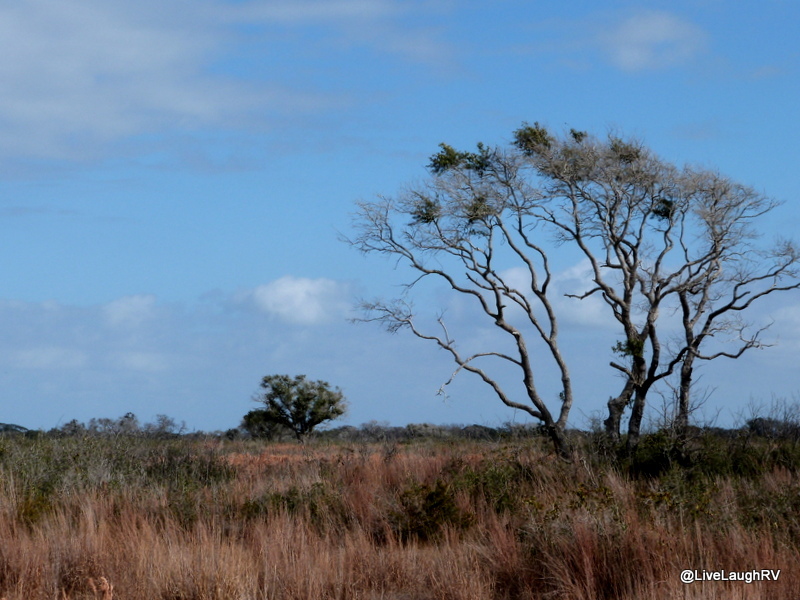 We drove from Okeechobee, FL to The Palm Beach area this morning and saw lots of birds along the way, but no gators yet. Great shot of the pelicans in flight, if I’m not mistaken those are moving birds, right? Yay. I did ask them to hold that position for one second…..lol. I love the pic where each bird is in a different state of flight. No, I couldn’t see the gator! This refuge gets a thumbs up for many adults, thumbs down for 3 years olds. LOL! 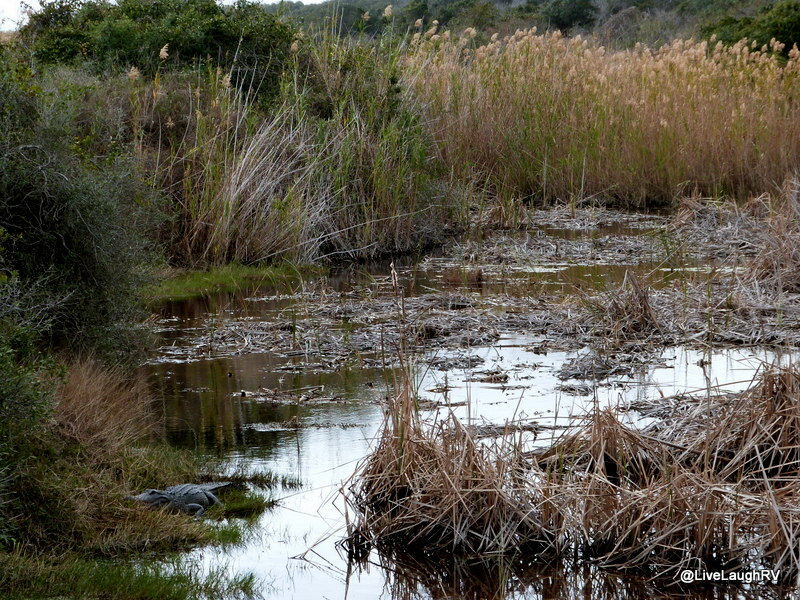 If I were a kid….gosh even a young adult, I would find the refuge a total bore, but now a days I appreciate the majestic beauty of the wildlife and the undisturbed beauty of the land 🙂 Gator toward the rear, on the left next to the brown marsh. So glad for this info. This area of Texas is definitely on our Bucket List now. Really love this post and all of your bird pictures. Thanks! Thanks. We are really enjoying it but don’t plan on any sandy beaches. 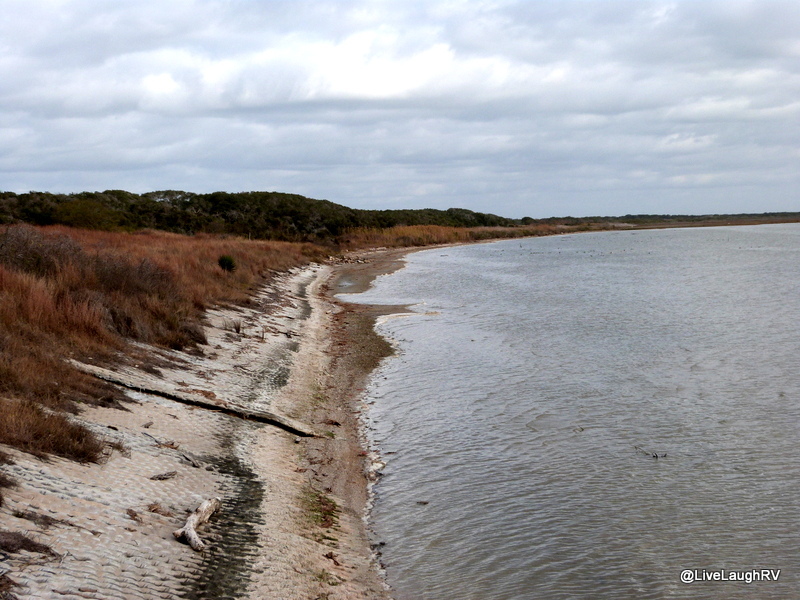 The big, sandy beach in Rockport is a fee use area. Great beach on Mustang Island (Port Aransas). You can even boondock on the beach but be forewarned about salt spray and corrosion. Great photos and well written. The line of birds directly over head is my favorite photo. We too took that loop and were able to stop along the way and explore. I remember feeling relieved when we finally got out. Thanks Mike. 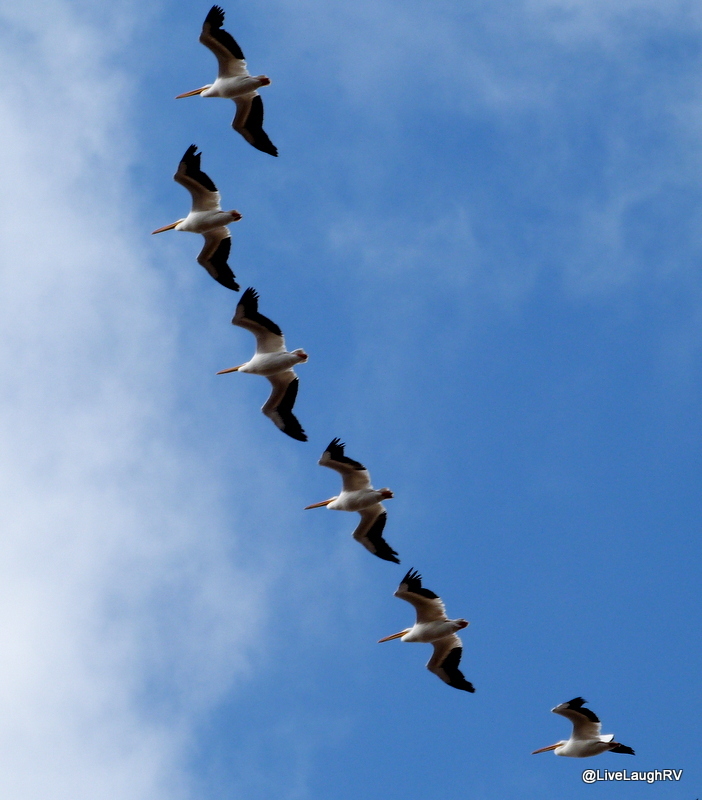 Yeah, the loop was kind of long but it was out there in the boonies where I captured that Pelicans in flight shot. I was actually tempted to cut through on the ‘authorized personal only’ road taking me back to the main drag. These are some awesome shots, Ingrid! I used to live in the state right above Arkansas but have never been there. Thanks Teri…..Hmm, aren’t you that gal from St. Louis who now lives in Columbus? Ingrid you are capturing some astounding shots. Keep up the great work. As far as seeing the alligator in the water…is it the from left corner? The photo of the real things was hopefully with a zoom lens!! Thanks. and Yep, you found him. The third shot of the gator depicts the real distance. First one, zoomed out with a wide angle; second, zoomed in; and third, close to what I saw with my eyes. He never moved. I think he was getting ready to take a nap as some of my close ups had him with his eyes closed. Well done! Fun contrast between your nearly meditative state and then snap! back to public bustling interruption. Some folks never stop for the 15 minutes, don’t know what they’re missing. Thank you for reminding us of the beauty out there. Beautiful, even if your solitude did get interrupted. I really like the Pelican???? If that is what it was. I don’t know about the wildlife photographers, but your birds were spectacular. Where is this located? Thanks Darla and yes that big white bird is a pelican as are the dozen or so in flight. This is just north of Rockport, Texas on the Gulf Coast. Thanks Sylvia. I just keep clicking and clicking in hopes I get at least one that’s focused. 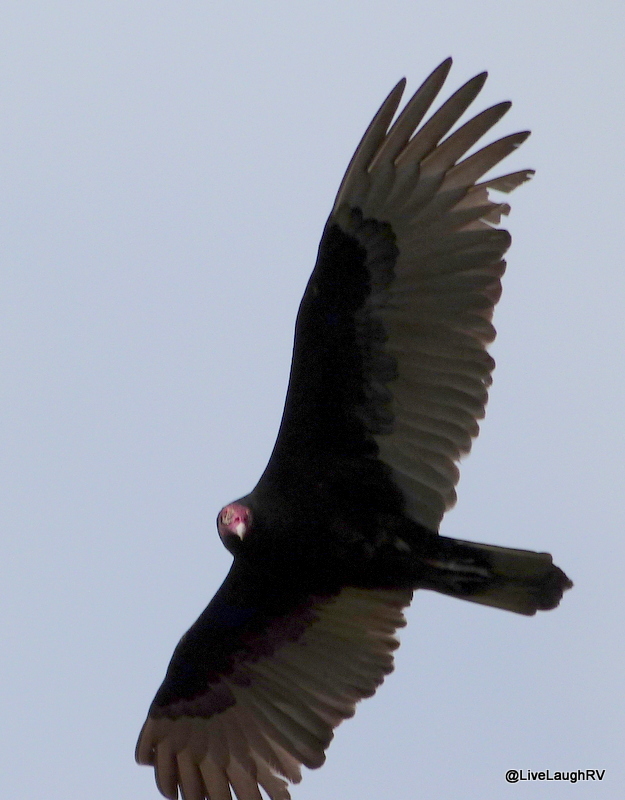 I keep wanting to set my camera on ‘burst’ but the birds always take flight when I’m not ready….go figure! Such stunning photos! Now I’m really excited. 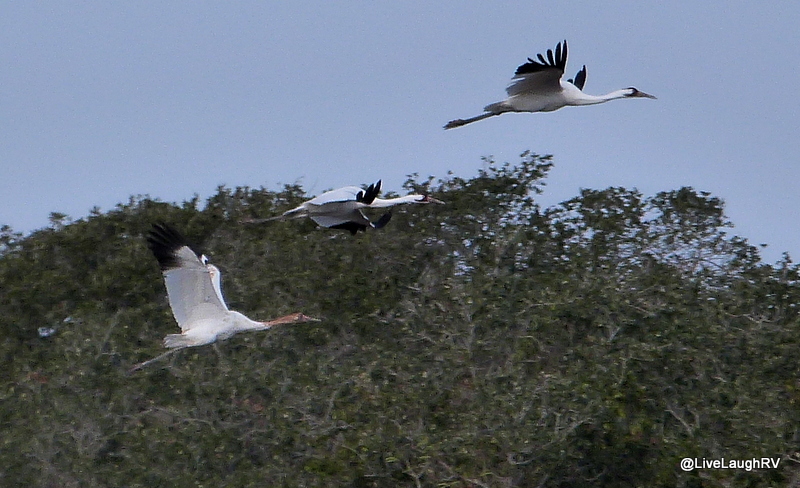 We’ve been seeing huge white birds with black tips and I was thinking Wood Stork, but now I wonder if it might be Whooping Cranes. I will definitely put Rockport TX on my list. We haven’t been to the Corpus Christi area yet, so perhaps next year. Does it have a red head? Oh, how I wish I had a longer lens. I’m dreaming of a T3i LOL. When you and the hubby decide to visit be sure and email me and I’ll share lots of tidbits. Thank you for this great info for this is my kind of place minus screaming brats. Look at you with your birds in flight capture!, well done! Is that white bird a Pelican? It is so huge, with the little birds around it not to mention it is a great shot.